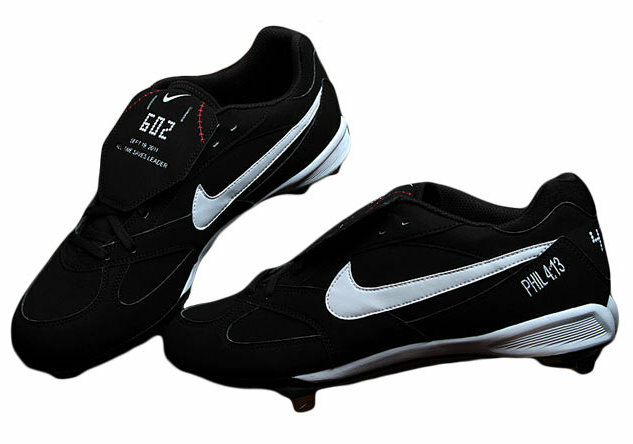 Mariano also wore the same cleats throughout his career, the Nike Cooperstown. Seen are Mariano’s special edition Cooperstowns, commemorating his record-breaking 602nd save (courtesy of SoleCollector.com). Both his glove and cleats have always referenced the bible verse “Phil: 4:13” from the book of the Philippians, “I can do all this through Him who gives me strength.” Though there is nothing like it available to us, the overall simplicity of the shoe makes it an icon in my eyes, and a perfect representation of Rivera’s legacy. Simplicity, humility, excellence. Categories: Gear, Cleats, New York Yankees, Pitcher, Mariano Rivera.